1. Biochemistry Biochemistry, Molecular Plant Breading, Enzymology, Pharmacology, Clinical Biochemistry, Molecular Biology, Molecular Genetics, Immunochemistry. 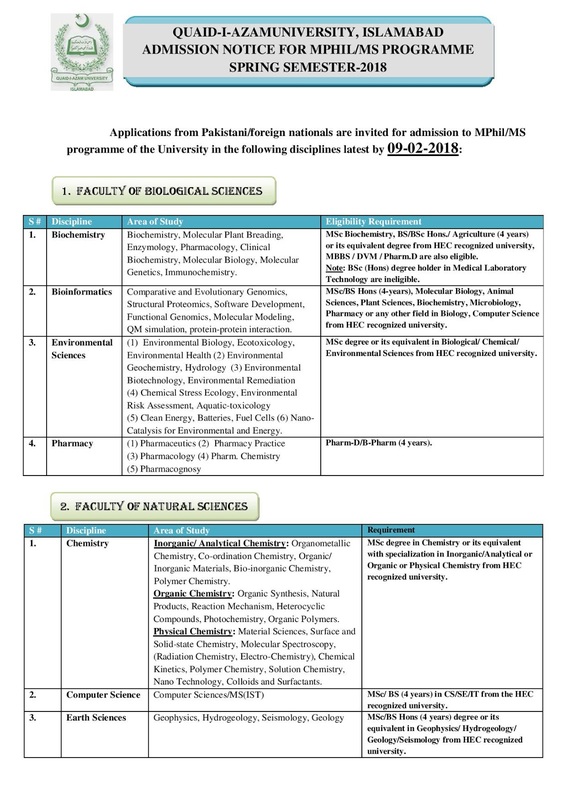 MSc Biochemistry, BS/BSc Hons./ Agriculture (4 years) or its equivalent degree from HEC recognized university, MBBS / DVM / Pharm.D are also eligible.Note: BSc (Hons) degree holder in Medical Laboratory Technology are ineligible. 2. Bioinformatics Comparative and Evolutionary Genomics, Structural Proteomics, Software Development, Functional Genomics, Molecular Modeling, QM simulation, protein-protein interaction. MSc/BS Hons (4-years), Molecular Biology, Animal Sciences, Plant Sciences, Biochemistry, Microbiology, Pharmacy or any other field in Biology, Computer Science from HEC recognized university. 3. Environmental Sciences (1) Environmental Biology, Ecotoxicology, Environmental Health (2) Environmental Geochemistry, Hydrology (3) Environmental Biotechnology, Environmental Remediation (4) Chemical Stress Ecology, Environmental Risk Assessment, Aquatic-toxicology (5) Clean Energy, Batteries, Fuel Cells (6) Nano-Catalysis for Environmental and Energy. MSc degree or its equivalent in Biological/ Chemical/ Environmental Sciences from HEC recognized university. 4. Pharmacy (1) Pharmaceutics (2) Pharmacy Practice (3) Pharmacology (4) Pharm. Chemistry(5) Pharmacognosy Pharm-D/B-Pharm (4 years). 1. Chemistry Inorganic/ Analytical Chemistry:Organometallic Chemistry, Co-ordination Chemistry, Organic/ Inorganic Materials, Bio-inorganic Chemistry, Polymer Chemistry. Organic Chemistry: Organic Synthesis, Natural Products, Reaction Mechanism, Heterocyclic Compounds, Photochemistry, Organic Polymers. Physical Chemistry: Material Sciences, Surface and Solid-state Chemistry, Molecular Spectroscopy, (Radiation Chemistry, Electro-Chemistry), Chemical Kinetics, Polymer Chemistry, Solution Chemistry, Nano Technology, Colloids and Surfactants. MSc degree in Chemistry or its equivalent with specialization in Inorganic/Analytical or Organic or Physical Chemistry from HEC recognized university. 2. Computer Science Computer Sciences/MS(IST) MSc/ BS (4 years) in CS/SE/IT from the HEC recognized university. 3. Earth Sciences Geophysics, Hydrogeology, Seismology, Geology MSc/BS Hons (4 years) degree or its equivalent in Geophysics/ Hydrogeology/ Geology/Seismology from HEC recognized university. 4. Electronics Wave Propagation and Scattering, Complex Media, High Frequency Electromagnetics, Metamaterials, Information Theory, Communications and Signal Processing, Coding Theory, Image Processing, Embedded Systems, Microelectronics. MSc/BS degree in Electronics/ Physics/ Computer Science/ Mathematics/ Information Technology or BS Electronic/ Electrical/ Computer Engineering/Telecommunications from HEC recognized university. 5. Mathematics Applied and Pure Mathematics. MSc/ BS (4 years) in Mathematics/Physics or its equivalent degree from the HEC recognized university. 6. Physics Atomic and Molecular Physics, Semiconductor Physics, Plasma Physics, Magnetism and Nanomaterials, High-Tc Super Conductivity, Laser Physics, High Energy Physics and Cosmology, Particle Physics, Nuclear Physics, Condensed Matter Physics, Quantum Optics/Quantum Information Theory, Computational Physics. MSc/BS (4 years) in Physics or its equivalent degree from the HEC recognized university. MSc/BS (4 years) in Statistics or its equivalent degree from the HEC recognized university. 1. Anthropology Cultural Change and Development, Ethnographic Studies, Cultural Diversity and Integration. MA/MSc/BS (4-years) degree or its equivalent in Anthropology/Sociology/Gender Studies/Behavioral Sciences/Social Sciences from HEC recognized university. 2. Defence & Strategic Studies International Security, South Asia, Global Political Economy, Arms Control and Proliferation Issues. MA/MSc degree or its equivalent in Defence & Strategic Studies, Security/ War Studies, Political Science, International Relations, Defence & Diplomatic Studies, Pakistan Studies from HEC recognized university. 3. Economics Micro/Macroeconomics, Econometrics, International/ Public/ Monetary/ Labour/ Development Economics. 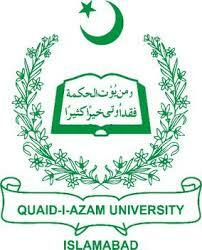 M.A/MSc/ BS (4 years) degree in Economics or its equivalent from HEC recognized university. (M.A/M.Sc. in Agriculture Economics/Business Economics & Home Economics are not eligible). 4. History Modern South Asian History MA/MSc in History/Political Science/International Relations/Sociology and Pakistan Studies or its equivalent from HEC recognized university. 5. Pakistan Studies All fields of Social Sciences relating to Pakistan. 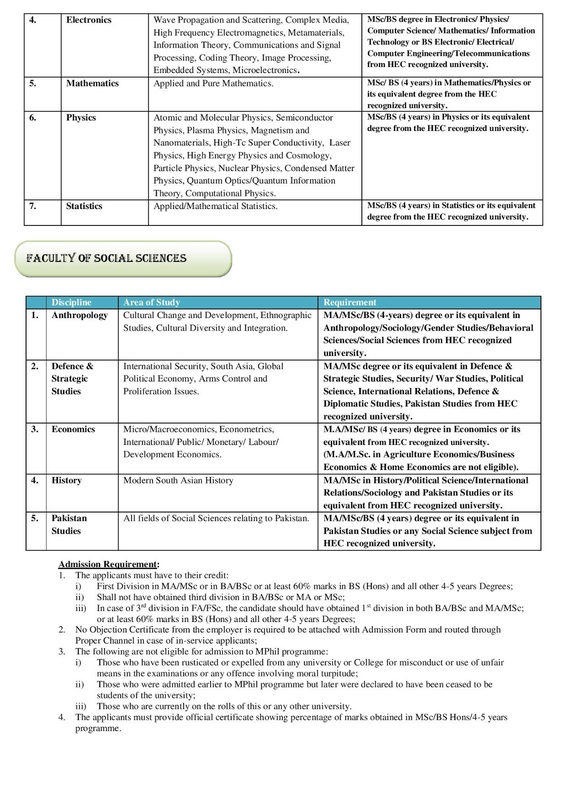 MA/MSc/BS (4 years) degree or its equivalent in Pakistan Studies or any Social Science subject from HEC recognized university. Those who are currently on the rolls of this or any other university. The applicants must provide official certificate showing percentage of marks obtained in MSc/BS Hons/4-5 years programme. The admission to MPhil programme shall be made on the basis of cumulative merit to be determined from previous academic record, University written subject test and interview. No separate call letters for test/interview will be issued. Only the test pass applicants will appear before the interview as per schedule of the Department/ Institute/ School/ Centre (DISC) concerned. The lists of the pass applicants shall be displayed on the notice boards of the relevant Department/ Institute/ School/ Centre (DISC). Applicants appearing in the Entry Test must bring original CNIC for identification. If a test date is declared as holiday or for any reason, the test will be conducted on the next working day. 8. D.S.S. 13-02-2018 Tuesday 11:30 AM Department of D.S.S. 1. The Admission Data Summary Sheet can be downloaded from the QAU website (Click here to Download Admission Data Summary Sheet), along with a Challan of the Habib Bank Ltd. OR Askari Bank Ltd. amounting to Rs.2000/-. 2.The applicants are advised to deposit the same in the Habib Bank Ltd. OR Askari Bank Ltd. in favour of the Treasurer, Quaid-i-Azam University, Islamabad (throughout the country with bank charges, non-refundable). 3.The Bank Challan should be attached with the downloaded Admission Data Summary Sheet along with other requisite documents; otherwise the incomplete and late applications shall not be entertained. 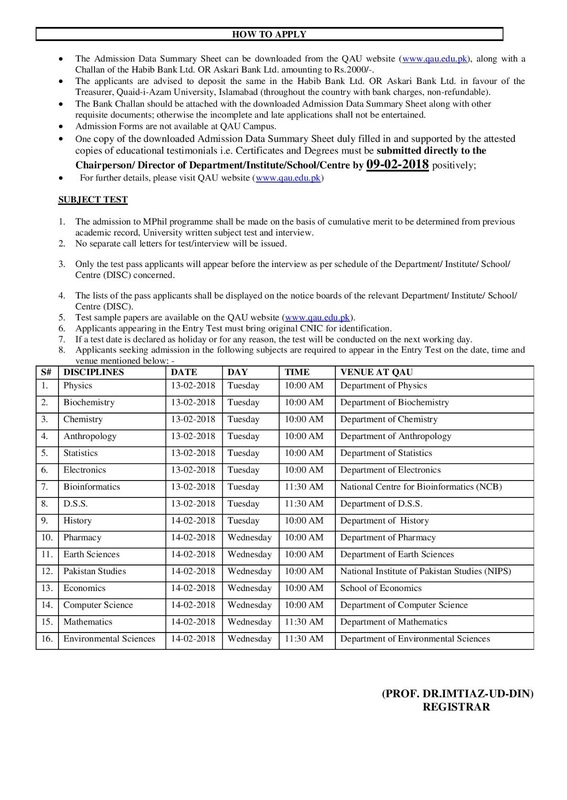 6.For further details, please visit QAU website.